Introduced for the 1932 season, the 16/60 was a well-engineered, solidly built design that furthered Humber's reputation as a quality marque. Based around a conventional ladder-frame chassis with a 10ft 2.5in wheelbase and 4ft 8in track, it featured all round semi-elliptic leaf-sprung suspension and four-wheel drum brakes. Rated at 16.9 HP by the Treasury, its 2276cc, six-cylinder engine utilised overhead inlet and side exhaust valves. Producing circa 55 bhp @ 3,600rpm, this torquey and refined unit reputedly gave the model a top speed of 61 mph. A reflection of its greater merit and finesse, the Humber cost up to fifty per cent more than the equivalent Austin or Morris. Only in production for four years surviving 16/60s are comparatively few and far between. 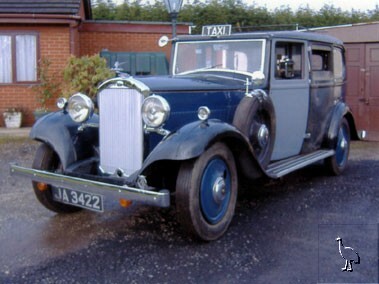 According to a letter on file from the Post Vintage Humber Car Club dated 9th February 2010, this particular example is the only 16/60-based taxi known to them and as such it has been valued for insurance purposes at not less than £12,000. The vendor informs us that she bought 'JA 3422' in 1994 "with a view to taking it to shows". Seemingly last on the road during 2002, it is now in need of some restoration work. Treated to a new wing some fourteen years ago due to rust and damage not to mention sundry rechromed trim pieces, the Humber still possesses its door handles and door cards (while, the driver's door has been retained too). Sporting a taxi meter, interior division, twin side-mounted spare wheels and fold-down occasional seats, this ultra-rare 16/60 variant has the makings of a rewarding project. An elegant machine of interest to both Humber and taxi enthusiasts alike, 'JA 3422' is accompanied by assorted literature (including the PVHCC valuation letter).